The interim budget has focused on two key elements — the farmers and the urban middle class with most of the direct and indirect benefits targeted at this segment. For micro, small & medium enterprises (MSMEs), which are critical, large-scale growth engines of the economy, other than the the interest subvention scheme and a few changes in the GST structure which is expected to help drive capex and generate employment, there is no much relief in sight for the MSME sector. Here are the few hits and misses of the current budget. A scheme to avail business loans of up to Rs. 1 crore within 59 minutes, to enable easy access to credit for MSMEs. Two percent interest rebate on incremental loan up to Rs 1 crore for goods and services tax (GST)-registered MSME units and this will be to incentivize honest tax payers. Increase in limits for eligibility of composition schemes for manufacturers and traders- The GST composition scheme, under which intra state suppliers of goods pay tax at a flat rate on the turnover (generally 1 per cent), can now be availed by businesses with a turnover of up to Rs 1.5 crore. It is proposed to increase this turnover limit with effect from February 1, 2019 (as per recommendations of the GST Council). GST composition scheme for small service providers- A composition scheme shall be introduced for supplier of services having a turnover of up to Rs 50 lakh. The service providers opting for composition scheme can pay tax at a rate of 6 per cent (CGST 3 per cent + SGST 3 per cent) on their turnover and would not be eligible to avail any input tax. The said scheme shall be applicable across all service providers. The service providers covered under the Composition Scheme shall be required to file 1 annual return and make quarterly payment of GST. The major disappointment for the sector would be that there was nothing done to ease the credit issues. According to the Economic Survey 2017-18, data on credit disbursed by banks shows that out of a total outstanding credit of Rs 26,041 billion as in November 2017, 82.6% of the amount was lent to large enterprises and MSMEs got only 17.4 % of total credit. The recent turmoil in the NBFC sector has added to the pressure. The interim budget made no efforts to ease credit linked issues. 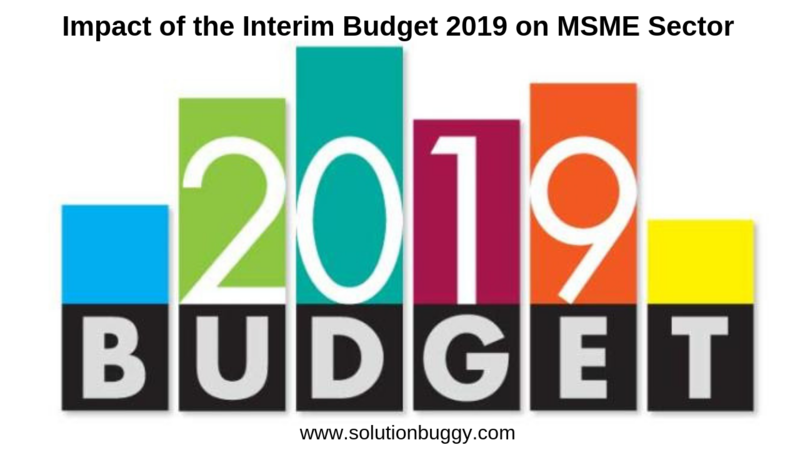 Overall the interim budget has tried to provide some sops to the MSME sector and reduce the burden on this sector. We have seen a lot of expansion projects, new plant setup, new product design etc being shelved or put on hold solely due to lack of credit facilities. SolutionBuggy has been able to get some funding agencies to get in touch with these entrepreneurs and help them with the credit facility. In case you are interested to know how SolutionBuggy has been instrumental in connecting the industries with the right consultants in various stages of operations then learn more here….